Local. Organic. Pizza, Lasagna, Salads, Beer & Wine. Content © 2018 Redwood Pizzeria. All rights reserved. Take Graham Hill Road (at the intersection of Highway 1 and Ocean Street). Drive 12 minutes to Highway 9 in Felton. Drive 1 block downhill to Redwood Pizzeria. Look for our "RW Pizza" sign on your right. Exit at Mount Hermon Road (#3) in Scotts Valley. Drive 5 minutes to Graham Hill Road in Felton. Drive 1 block to Highway 9. Look for the "RW Pizza" sign on your right. "Why are you never open?" We are often asked, "Why are you &apos;always&apos; closed?" We tried staying open 7 days a week for lunch and dinner and found that we prefer to keep the prices reasonable and our families close, so we have focused on the busiest hours. We apologize for any inconvenience. Thanks for understanding. And as always, thanks for your encouragement and continued support! Redwood Pizzeria is the perfect venue for large groups to share a delicious, affordable meal together. We have hosted many different parties — birthdays, wedding rehearsals, fundraisers, sports teams, and more. Our Party Room is about 1000 square feet and seats 40 guests. Groups of less than 20 will probably be asked to use only half the room. There is no reservation fee or hourly use fee for the room, but there is a substantial minimum order to reserve the whole room, and a standard 18% service fee applies to any group of 8 or more. Sports teams (if using separate bills) — we require PRE-ORDERING via email or phone, and we will only accept large and medium size pizza orders. If you would like to see the party room in person, please visit us during regular business hours. If you would like to reserve a date for your next large group event, please email us at redwoodpizzeria@gmail.com. Thank you for your interest, we look forward to seeing you soon! 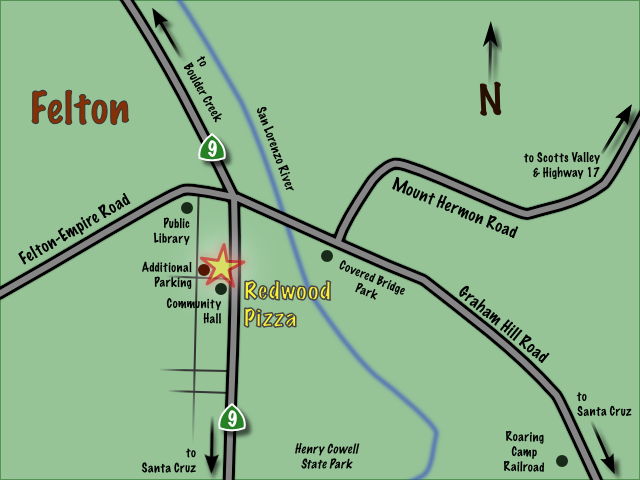 Redwood Pizzeria was opened in May 2005 by Evan Borthwick and his family. We have since made many improvements, most related to the quality of the food. In early 2007, we upgraded our dough and marinara sauce—as well as all the fresh vegetable pizza toppings—to be 100% organic. We have also added organic mozzarella cheese to our menu. We source most of our ingredients locally, including all our produce and wines. We are NOT a chain, and virtually everything on the menu is prepared fresh. Our business model is to offer a fresh, healthy, delicious meal at an affordable price. 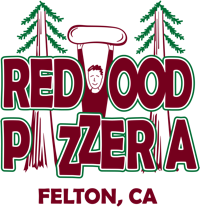 Redwood Pizzeria is also an active member of the local community, sponsoring numerous youth teams and holding fundraisers for many non-profit organizations. Thank you very much for all your encouragement and support, we look forward to seeing you soon! Please visit our facebook page for special discounts and coupons! Our menu should appear below, but it may also be downloaded (front and back pages).